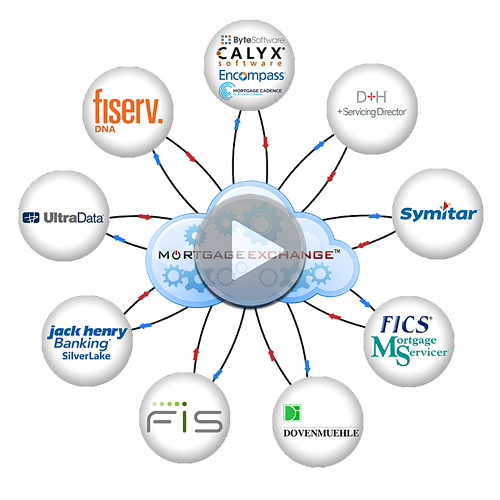 MortgageExchange- Many mortgage industry applications provide exceptional functionality—but what happens when you want to move your data between systems? Or what if you need functionality that existing applications don’t deliver? When these issues arise, many mortgage-related companies are still manually reentering data or staying with systems that don’t meet their needs. ABT focuses on the Mortgage Departments of traditional financial organizations such as Banks and Credit Unions, CUSOs and other supporting service organizations. State housing authorities, Non-Profit organizations like Habitat for Humanity as well as Mortgage Banks and Brokers. 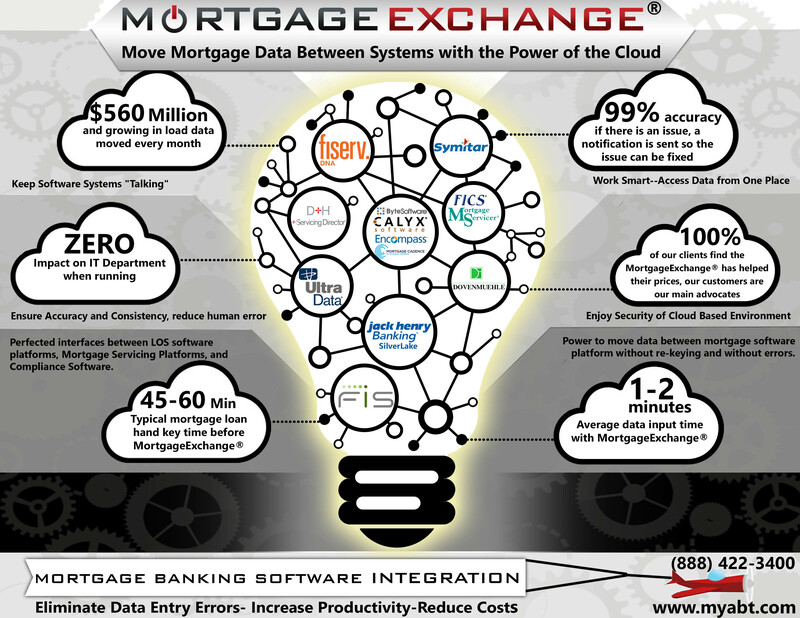 One of our core strengths is moving data between mortgage software platforms. Within Banks and Credit Unions we eliminate the need to re-key data between, Origination – Servicing – Core – Accounting. Build trust with your borrowers and compliance auditors. Add the ABT security Icon in your email signature that links to our website explaining all of the precautions you take with their sensitive information. MortgageExchange™ provides cutting edge security for your staff and borrowers. Our SSAE 16 TYPE II Certification gives you, your borrowers and auditors peace of mind. We provide data security for over 500 mortgage companies nationwide. We work directly with state auditors to ensure our clients are 100% compliant with new banking standards and the safeguards rule. Your organization receives an ABT Due Diligence package with our compliance certificates and security policies. ABT provides dozens of cross application integrations that give our clients the edge in business processes. We are longtime partners and have interfaces between LOS software platforms, Mortgage Servicing Platforms, and Compliance Software. Founded in 1985, Byte Software is located in Kirkland, Washington. While our roots are in point of sales solutions, our BytePro platform streamlines the entire mortgage production process from origination through sale on the secondary market. 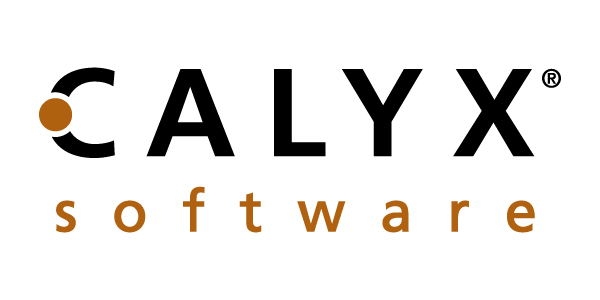 Calyx Software® is dedicated to helping mortgage professionals increase their profitability by providing reliable and affordable software that streamlines and optimizes all phases of the loan process–from loan marketing through closing. The Calyx® Solution connects loan originators and processors to borrowers, lenders, and service providers, using technology that allows all parties to exchange data easily. This seamless interaction, coupled with the robust features in the Calyx product line, increases efficiency and maximizes profitability by enabling more loans to close more quickly. At Ellie Mae, we’ve been changing what’s possible in the mortgage business since 1997. And while the industry has changed, our mission to automate mortgages so lenders can achieve compliance, quality and efficiency hasn’t. Nor will it. We serve banks, credit unions and mortgage companies of all sizes. We’re committed to our clients. We’re committed to the mortgage business. And we’re committed to innovating how mortgage professionals work, and work together, to originate, process and close high-quality, compliant loans. 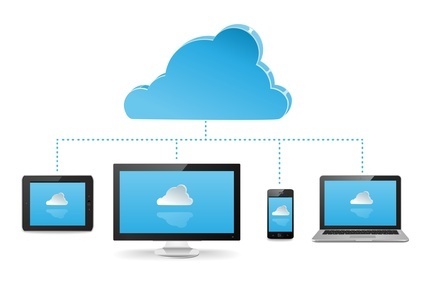 Available anytime, anywhere thanks to the Mortgage Cadence Cloud, the Loan Fulfillment Center operates in one comprehensive single database that deeply connects it to the Borrower Center, Document Center and Imaging Center, allowing for a seamless experience. D+H creates financial technologies the world’s financial institutions rely on every day to help them grow and succeed. Solutions that help move the world forward; because that’s what happens when the world knows it has financial institutions they can trust. Founded in 1983 and headquartered in Dallas, Texas, Financial Industry Computer Systems, Inc. (FICS), specializes in providing flexible, comprehensive residential and commercial technology solutions to the mortgage industry. In our over 31 year history, we have provided over 1400 financial organizations nationwide with significant competitive advantages through the use of our mortgage software systems. In 1976, Jack Henry & Associates (JHA) was founded on the premise that strong relationships and sound technology go hand-in-hand. Today, with more than 11,300 customers and over 5,600 associates, we combine this idea with the pursuit of one common goal – excellence in financial services. Dovenmuehle Mortgage, Inc. (“Dovenmuehle”) provides a complete, private label mortgage subservicing program for commercial banks, thrift institutions, credit unions, mortgage bankers, and state and other housing finance agencies. Cenlar FSB, the nation’s leading loan servicing provider, has been actively engaged in mortgage loan servicing and subservicing as a core business for more than 40 years. Banks, credit unions, mortgage companies and other participants in the financial industry use our Loan Servicing Solution. ComplianceEase® is a leading provider of intelligent business solutions to financial services institutions. The company was founded by mortgage banking executives and technology professionals with a shared vision to develop innovative solutions and services to help the residential mortgage industry solve fundamental problems and minimize operational risks. First American's Software Solutions Group provides custom software solutions for the real estate and financial services industries, including application and database development, system integrations, and Web design. 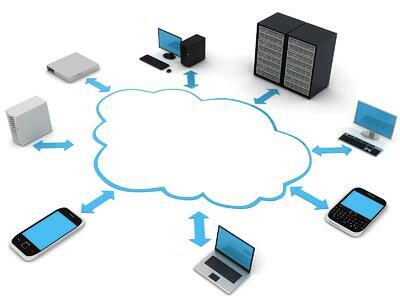 Our past software solutions have included order placement and tracking systems, customer and vendor management systems, accounting systems, etc. Over 10 years ago, Optimal Blue created the first web-based product eligibility and pricing engine. Today, with hundreds of lenders across the US leveraging their services to manage their secondary marketing department requirements and deliver more margin from their business, Optimal Blue is the most reliable, accurate and trustworthy source for product eligibility and pricing solutions.